Ideal for semi-circular or circular areas. 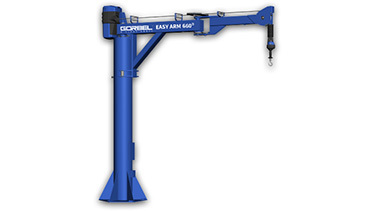 Ergonomic Partners provides several types of steel and aluminum Gorbel jib cranes for all of your lifting applications. Whether you need a small ergonomic hand push jib, or a fully motorized jib crane with a powered rotation and trolley/hoist, we sell Gorbel jib cranes that are right for your needs. If you're not sure a Gorbel jib crane is right for your application. 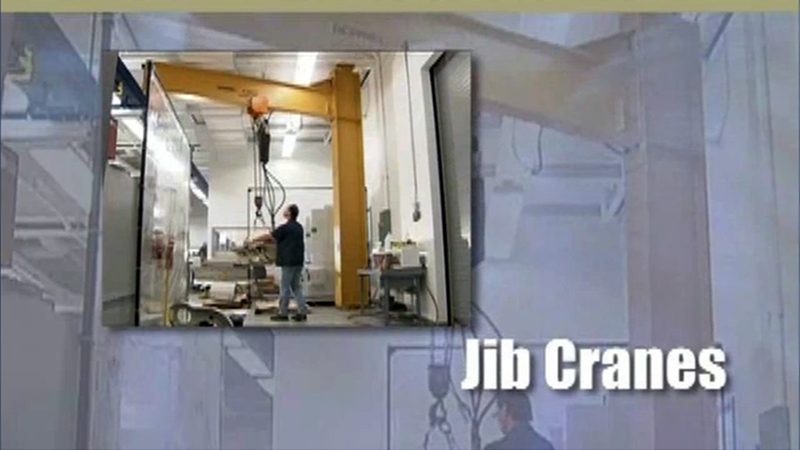 Check out our crane demos on our video page to see our jib cranes for sale in action. Tool Balancer Jibs are designed for light loads 50 pounds or 150 pounds and include Gorbel's enclosed track and trolley like the work station jib product line. They have a small mounting footprint and 180° or 200° rotation. The tool solutions jibs provide the most cost effective solution for applications with suspended tools such as welders, pneumatic tools and hand tools. 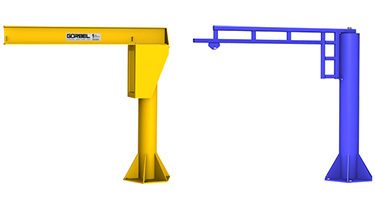 Free Standing Jib Cranes have 360 degrees of rotation and are ideal for providing smooth, safe and efficient lifting for all kinds of loads including: tool balancers, air balancers, hoists, intelligent lifting devices and welders. 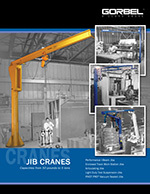 These Gorbel jib cranes are available in I-Beam or Work Station Enclosed Track styles. 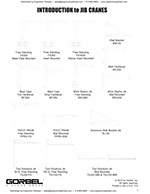 Wall or column mounted jib cranes are available in several types: Wall Cantilever I-Beam Jib Cranes, Wall Bracket Jib Cranes, Aluminum Wall Bracket Jib Cranes, and Wall Mounted Work Station Jib Cranes. 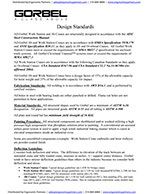 Capacities range from 100 lbs to 5 tons. These jibs typically give you 200 degrees of coverage and can be installed in less than a day. 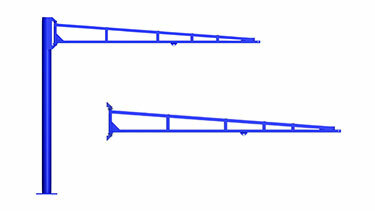 Articulating Jib Cranes can position loads in places that cannot be reached with traditional jibs. 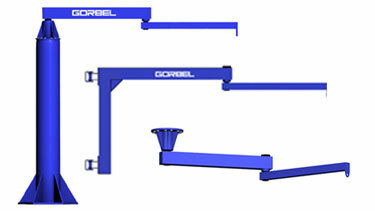 These Gorbel jib cranes can move loads around corners, reach into machines or doorways, and swing under obstructions. Available in Freestanding, and Wall or Column Mounted styles. Pivot Pro articulating jib cranes are designed to fit all major vacuum tube lifter equipment manufacturers. 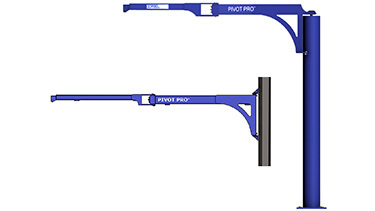 The Pivot Pro allows for precise positioning by eliminating the "whip" of the boom that is experienced in repetitive and high cycle applications. The Gorbel Easy Arm is a "smart lifting solution". It combines a custom articulating jib crane that is integrated with the Gorbel G-Force "smart hoist". The Easy Arm is the ideal solution if you're looking for a turn-key lifting device that provides fast and precise load placement. 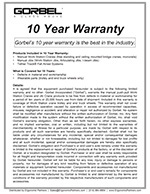 Ease of Movement, Increased Safety, Productivity, Reliability and the Industry's Best Warranty - 10 Years on Manual and 5 Years on Motorized Products! Ease of Installation, Modular Design for Flexible Factory Layout. Quick Delivery-5-10 Day Quick Ship on Standard Products. Made in the U.S.A. | Multiple U.S. Shipping Points - Plants in NY and AL and "If It's Late, We Pay the Freight". All Work Station Cranes are in accordance with the following Canadian Standards as they apply to Overhead Cranes: CSA Standard B167-96 and CSA Standard C22.2 No.33-M1984 (reaffirmed 2004). 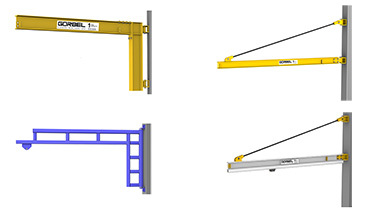 All Gorbel Jib and Work Station Cranes are in accordance with OSHA Specification 1910.179 and ANSI Specification B30.11, as they apply to Jib and Overhead Cranes. All Gorbel Work Station Cranes meet or exceed the requirements of MMA MH27.2 specification for enclosed track systems. All Gorbel Cleveland Tramrail systems meet or exceed the requirements of MMA MH27.1. 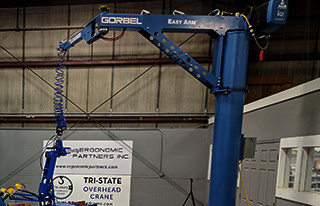 Ergonomic Partners services and is a Master Distributor for Gorbel Jib Cranes; serving clients from coast to coast, Canada, Mexico and especially focused in the states of Missouri, Illinois, Indiana, Kansas, Arkansas, Mississippi, Nebraska, Tennessee, Kentucky, Iowa, and Oklahoma.